This article was originally published on April 8, 2011, in the Shenzhen Daily. I continue to hear, from supposedly-knowledgeable people, that "There is only one temple in Shenzhen." They are referring, of course, to Hong Fa Buddhist Temple in Fairy Lake (Xian Hu) Botanical Gardens. While Hong Fa is indeed Shenzhen's premier Buddhist temple, the city boasts an increasing number of Buddhist sites in addition to its many, many Daoist and folk temples. I recently discovered a new Buddhist temple located in Huashan Park in Shajing. Although it's a couple of hours and several changes of bus from the center of town, and there's not much there yet, it's still exciting to see this "temple in the making." When finished, Guanyin Temple will have all the features of any first-class temple: a Mountain Gate, Four Kings Hall, Buddha Hall, Sutra Repository, and, excitingly, a Ten-Thousand Buddha Pagoda. Ciyun Ge, "Cloud of Compassion Pavilion"
Currently, the only worship hall that is completed is the "Ciyun Ge," or "Cloud of Compassion Pavilion." Inside is a fine statue of a six-armed Guanyin (Avalokiteshvara, the Bodhisattva of Compassion) in a pose of royal ease, accompanied by his/her usual two attendants, Long Nu (Dragon Maiden) and Shan Cai (the young monk Sudhana). Elsewhere on the grounds is a utility hall with the guest office, monks' quarters, and dining hall; and a large Chan (meditation) hall is well on the way to completion. 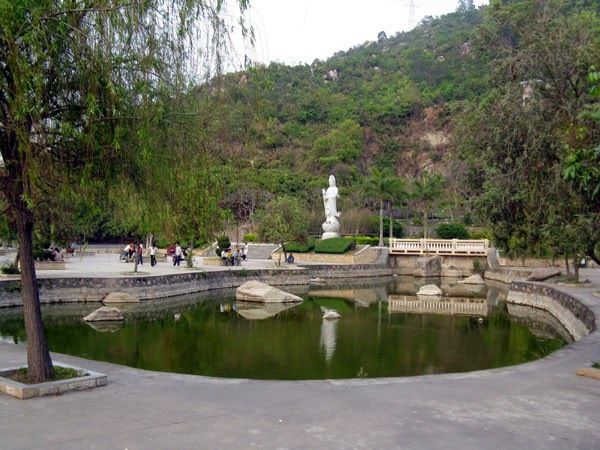 The location is spectacular; it's situated on a hillside with two artificial ponds, and two monumental standing statues of Guanyin. If you have the time, head out to Shajing and see this major temple as it comes to life.